Android tablets make great gifts for everyone, from three-year-olds to grandmas. However, with so many devices out there, how can you make sure you get the best Android tablet for your money? There are probably hundreds of them on Amazon, and avoiding the overpriced and the plain bad can be daunting. But it doesn’t have to be that hard. Just take a look at the options below – they are the very best Android has to offer, and you really can’t go wrong with any of them. Without further ado, here’s our list of the best Android tablets available so far in the year 2018. Editor’s note – We will be updating this list as more devices hit the market. If you’re looking for a device on the high end of the price scale, look no further. Samsung’s Galaxy Tab S4 is one of the best tablets you can buy right now. The Galaxy Tab S4 has a 105.5-inch Super AMOLED display, quad speakers for stereo audio, and a large 7,300mAh battery that is definitely a big improvement over the 6,000mAh battery found on the older Tab S3. Not only that, the Tab S4 also comes with an S Pen that’s perfect for taking notes and drawing. Samsung is pushing the Galaxy Tab S4 for business and enterprise customers who may want to replace their laptops with this tablet. You can purchase an optional olio-style keyboard case for the Tab S4 for $150, and it’s also offering a USB Type-C to HDMI adapter for $50. If you connect the cable to an external PC monitor, you can use the tablet in DeX mode, which offers a more PC desktop-like UI experience. The Galaxy Tab S4 is a bit pricey with a starting price of $649 for the Wi-Fi 64GB version. You can also get the tablet with LTE hardware for $729.99, with a Verizon Wireless plan. Huawei recently refreshed its MediaPad Android tablets lineup with its new M5 models. The 8.4-inch version of the MediaMad M5 is an excellent tablet device, but its going to be hard to get a hold of if you live in the US. The design of the M5 is not much different than the older MediaPad M3. Inside is a different story, with a boost in processing power with its Kirin 960 chip, which allows it to play high-end 3D games with few issues. The M5 also includes an improved 13MP rear camera, and Android 8.0 Oreo out of the box. You can also buy the tablet with as much as 128GB of onboard storage. It also keeps its dual Harmon Kardon speakers and its 5,100mAh battery, which should last users for several days with casual use. There’s also an option to add LTE connectivity. The Huawei Media M5 is certainly among the best Android tablets you can buy. If you live in Europe, you can get this device, with prices starting at 349 Euros depending on its storage and connectivity. Again, there’s no word on when this tablet will be sold in the US. Amazon’s Fire family continues to get better, and cheaper too! The Fire 7 starts at just $49.99, the Fire HD 8 starts at $79.99, and you can get the Fire HD 10 for just $150. 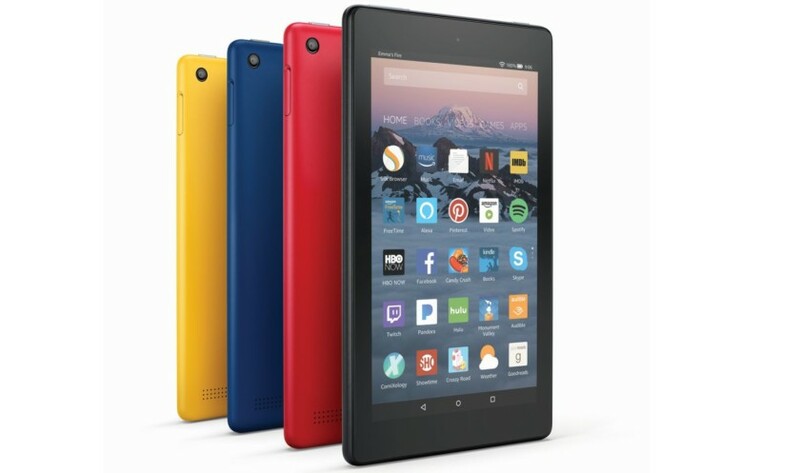 The Amazon Fire 7 includes a 7-inch 1,024 x 600 IPS display. Inside, it has an unnamed quad-core 1.3GHz processor, 1GB of RAM, a VGA front-facing camera and a 2MP rear camera. The battery life for the new Fire 7 has been upgraded from seven hours to eight hours on a single charge. It also has dual-band Wi-Fi hardware for the first time. You can purchase the tablet in black, yellow, blue, or red colors. The Amazon Fire 7 starts at the near rock-bottom price of $49.99 with 8GB of onboard storage and “special offers” that appear on the tablet’s launch screen. You can also get the tablet for $69.99 with 16GB of storage and “special offers.” Both versions have a microSD card slot for adding even more storage. You can get rid of those ads on the launch screen if you pay $15 more for either model. There’s also “Kids Edition” of the Fire 7 if you want to give one to your children, or friends with kids. They both include a tough “kid proof” case, a two-year “worry-free” guarantee and free access to Amazon FreeTime Unlimited, which offers kids access to 15,000 curated books, videos, educational apps, and games, along with parental controls and other content. The Fire 7 Kids Edition, with 16GB of storage, is normally priced at $99.99. The new version of the Amazon Fire HD 8 tablet has an 8-inch 1,280 x 800 display, 1.5GB of RAM, and up to 12hours of battery life. It shares the same processor, cameras, Wi-Fi hardware and color options with the smaller Fire 7. Prices begin at $79.99 with 16GB of onboard storage and “special offers”, or $109.99 with 32GB of storage and “special offers.” Again, you can purchase the tablet without those pesky Amazon ads for an additional $15. You also have the option to buy the “Kids Edition” of the Fire HD 8 tablet. It includes a tough “kid proof” case, a two-year “worry-free guarantee” and free access to Amazon FreeTime Unlimited, which offers kids access to 15,000 curated books, videos, educational apps, and games, along with parental controls and other content. The Fire HD 8 Kids Edition, with 32GB of storage, costs $129.99. Thankfully, it does not include “special offers”. Last but not least, the Amazon Fire HD 10 is an amazing value, starting at $149.99. For that price you get a 10.1-inch 1080p display, 32GB storage (64GB option also available for $180), microSD expansion, unlimited cloud storage, and more. The device is powered by a MediaTek quad-core processor with 2GB of RAM. What really makes the Fire HD 10 stand out is its integrated Alexa functionality. While all the Fire family now offers this, the Fire 10 is hands-free. That means you can essentially use it in a similar way to devices like the Amazon Echo family. As with the others, you don’t get Google Play and have a very customized Android experience, but at this price point — it’s hard not to be impressed. More and more Chromebooks can run Android apps, but only a couple are in tablet form. By far the best Chrome OS tablet on the market is the Google Pixel Slate. It has a big 12.3-inch QHD LCD display, with a 3,000 x 2,000 resolution, and 8MP cameras on the front and the back. The onboard battery should last up to 10 hours on a single charge. It uses a custom version of Chrome OS, with the desktop version of the Chrome browser, rather than the mobile version. However, it can also run almost any Android apps from the Google Play Store. The cheapest version, with an Intel Celeron processor, 32GB of storage and 4GB of RAM, costs $599. There’s one with an Intel Core M3 chip, 64GB of storage and 8GB of RAM, for $799. The tablet is also sold with an Intel Core i5 chip, 128GB of storage and 8GB of RAM for $999. Finally, you can get the tablet with a fast Intel Core i7 processor, 256GB of storage and 16GB of RAM for the very high price of $1,599. There you have it – our picks from the best Android tablets that are available right now. Missed anything? Tell us in the comments!